​Does your wood have scratches, screw holes, scrapes, and other minor imperfections? The easiest, quickest way of making them disappear is to use wood filler before painting the affected areas. The first step when using wood filler is to prep the affected areas before filling them. After that, you just sand down the spots, and when they’re smooth, you stain or paint the wood to make the imperfections disappear. It’s that easy, but you will want to go through the guide below to have a clearer picture of the process. If you’re looking for the good wood filler, we’d advise you to go for a brand that is stainable, because that way, you can match the wood filler’s color to the color of the wood. There are water-based fillers that can be stained, but keep in mind that these are only meant for indoor use. Another option is epoxy that is designed for wood. If you can’t buy epoxy or wood filler, go ahead and make some at home. All you need to do is mix up some carpenter’s glue with sawdust. Though the resulting option is not as effective as store-bought filler, it is still pretty useful. Are there splinters or paints flakes obstructing the imperfection on the wood? You’ve got to remove these with a scraper or another suitable tool. When applying wood filler, a rough edge is one of the biggest huddles you can face. Therefore, consider sanding down the wood to create a smoother surface that will hold the filler properly. Depending on the coarseness of the rough edges, you can use sandpaper of different grit sizes. But, don’t remove too much substance; you’re only looking to smooth out the surface. Before you apply the wood filler, you will want to remove any debris on the imperfection. The sawdust left by the sanding is one of the debris to look out for, as it can lower the stickiness of the filler. Wipe down the area with a damp piece of cloth and allow it to dry completely before applying the filler. You can use a tube or a stick to force the filler into the hole, scratch or whatever imperfection you’re dealing with. Press the product down and ensure that it goes all the way into the imperfection. Apart from a tube or a stick, a putty knife can be very helpful in applying the filler. 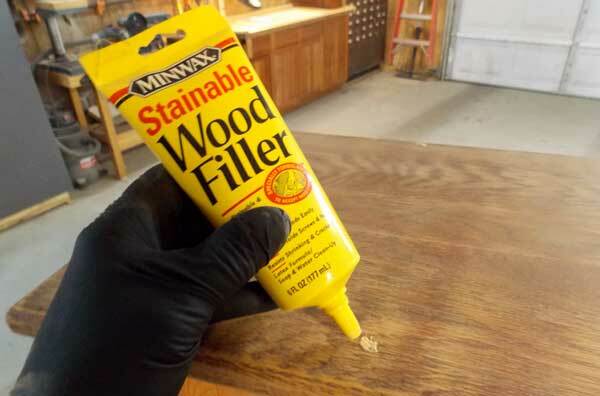 When putting the filler into the hole, be sure to overfill it to a level higher than that of the rest of the wood. The sense in this is that the filler will shrink when drying and it will end up on the same level as the rest of the wood if it’s overfilled. After applying the filler, you want to smooth it out using a putty knife perhaps. Once the filler is smooth, wait for it to dry. If you’re dealing with a small hole, an hour might be enough, but if the hole is big, the drying might take up to 8 hours. And of course, the brand of filler that you’re using will determine the drying time so check the information displayed on the filler packaging or manual. Once the wood filler is dry, it will be hard to the touch. Use sandpaper to smooth out the area and bring it to a level even with the rest of the wood. Sandpaper is fine but if you want to make the task easier, consider using an orbital sander. After sanding the spot, use a dry cloth to wipe off the sawdust or debris. Run your fingers over the part you have just repaired with wood filler to feel the smoothness and check if there’s any difference between it and the rest of the wood with regards to level. The drying and the sanding might have created a depression on the hole, and if this happens, you will want to fill out the depression. Repeat the process of filling the hole and bring the spot to uniformity with the wood. You might want to apply primer before painting the area. Okay, it’s true that you can directly paint over most fillers, but if you want the paint to adhere perfectly and look great, a primer would be most helpful. Of course, you can paint the affected area alone, using a shade similar to the sounding wood but painting the entire furniture would produce much better results. If you want to paint only the affected spot, consider testing the paint on an inconspicuous part of the furniture to make sure the paint will match the rest of the wood. The good news is that wood filler is typically pretty safe and there’s nothing really that you have to worry about when using it. The product is not reactive as it is chemically stable and again, under the current environmental laws, it is not classified as hazardous. Also, it’s normally not flammable. However, manufacturers recommend that you don’t send the product down the drain and that if you have to dispose of the product, you do it according to your state’s environmental laws on such products. Safety googles will help you avoid eye contact while a pair of gloves will keep your skin from having direct contact with the product. In the event that your eyes come into contact with the product, flush them immediately with plenty of water and if the irritation doesn’t go away, see a doctor. If the paste touches your skin for a prolonged duration, you might experience some redness, cracking, and irritation. To avoid that, wash the paste off immediately with soapy water. Ingesting the product might cause vomiting and diarrhea. If you accidentally ingest it, rinse your mouth immediately and take at least three glasses of water. It would be good to seek medical help you if feel unwell. The product is normally packaged in a small container that should be stored in a cool, dry place that is frost-free and that has good ventilation. Also, keep it out of kids’ reach. 1. What can I do if the stain won’t cover the wood filler? Try taking a little blob of the filler and put a few stain drops in there. Knead the filler and the stain together and apply it. 2. What items do I need to prepare imperfections and fill them with wood filler? Some of the most important items you’ll need include a putty knife, sandpaper, wood stain or paint, tack cloth, and of course the wood filler itself. You might also want to have a primer and a paint brush. 3. How does wood filler differ from wood putty? The main difference between wood putty and wood filler is that while the former consists of plastics like polyurethane, epoxy, and fiberglass, the latter is made up of wood fibers or sawdust combined with a binder. Another major difference is that filler hardens, but putty doesn’t. 4. How much drying time should I give the filler before I sand it? If the repair is shallow, around 15 minutes to an hour will be enough, but for deep repairs, the drying might take up to eight hours. But then again, the drying time is also determined by the filler brand, so ensure that you check the packaging to see the recommendations/estimations on the drying time. So, you don’t have to replace your furniture because of those little imperfections. You only need to purchase a wood filler or make some at home using sawdust and carpenter’s glue and use it to fill up those holes and scratches. Feel free to leave a comment and share the article with your friends on the internet.